Went to Bow Valley Provincial Park today. Absolutely superb sunny day, 28°, campground was full yet there were no people around on any trail. I found this quite amazing. So the only living beings I encoutered were bugs ... of sorts... on beautiful wild flowers. 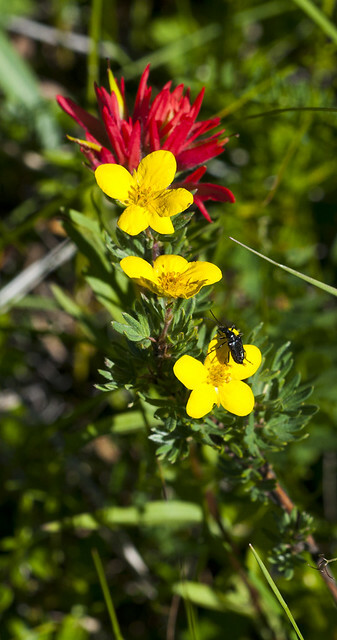 Here is an Indian Paintbrush with a Cinquefoil, all being attacked by a bug. Did you rescue them from certain destruction by chewing? I like the way the flowers line up. no rescue needed; there are so many flowers right now the bugs are feasting. And yes, summer may actually have arrived in our part of the world. We are never too sure of that, last year we missed that day.